Lenogo iPod to PC Transfer for Mac is great tool for Apple iTunes users who can't copy music files from iPod to pc desktop or laptop since iTunes blocks iPod-to-computer song transfer. Now, with iPod to PC Transfer for Mac, iPod users can transfer iPod Audio and Video files to Mac based PCs easily. 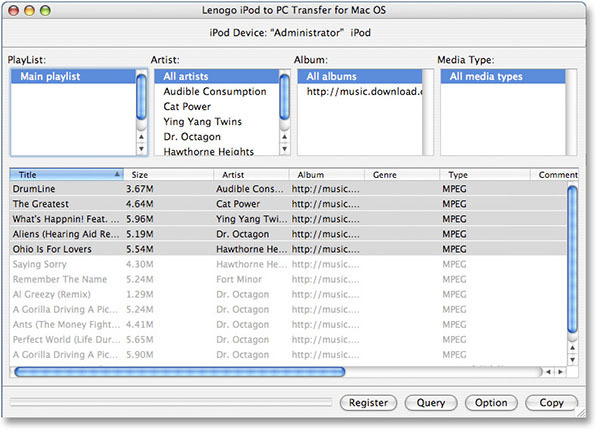 Lenogo iPod to PC Transfer for Mac utilizes iPod's internal database to display your iPod's contents instantly. ...... and 5th generation iPod), iPod Photo, iPod mini, iPod shuffle, iPod nano and iPod Video. Every iPod owner sooner or later needs to transfer the contents of their iPod back to their PC. Unfortunately, iTunes doesn't provide this feature at all. But there can be a number of cases when you need it, for example, when multimedia files get lost after your format the hard drive or when you want to make a backup of an entire iPod collection. Now, with iPod to PC Transfer for Mac, you can transfer Audio/Video files from iPod to your computer, and sync iPod playlists back to your iTunes at the same time. Lenogo iPod to PC Transfer for Mac is designed to back-up your entire iPod music library. Try it today for free with our FREE DOWNLOAD! NO RISK! FREE TRIAL! Qweas is providing links to iPod 2 PC Transfer for Mac 2009.11614 as a courtesy, and makes no representations regarding iPod 2 PC Transfer for Mac or any other applications or any information related thereto. Any questions, complaints or claims regarding this application iPod 2 PC Transfer for Mac 2009.11614 must be directed to the appropriate software vendor. You may click the publisher link of iPod 2 PC Transfer for Mac on the top of this page to get more details about the vendor.